We have sold hundreds of badges, and we listen closely to customer feedback to make sure we're delivering on the promise of unique, authentic clothing, world class service, and great prices. We survey every customer to gauge their opinion of the products they bought, and put together this list of the top-ranked badges in our store. Shop with confidence, knowing that these terrific badges have been tested and endorsed by our other customers, and that you will receive five star service along with a great value! Every one loves this badge. 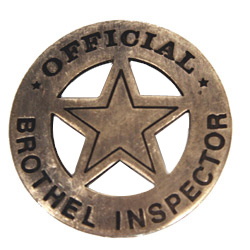 But if you wear it, you better have a pocket full of 'Brothel Tokens'. And having a little information about "Inspectors" is handy. This badge feels authentic and has a great look. After rummaging through many sites for this type of badge, I realized the emporium offered this classic looking badge at a good price. Being from Los Angeles area in California, I would not settle for a badge that named a different state or county that I viewed in other sites. I immediately settled with this badge for its look. It didnGÇÖt take long for my package to arrive at my home, (1 full day, since I had ordered the badge in the afternoon, was shipped out the following day, and I received it the very next day) and I was very pleased to find that the badge had a great weight, paint, and authentic feel quality to it. I also like that the pin is discreetly placed behind the badge in such a way that it cannot be seen in-between the design of the star. Overall I am very pleased with my order. 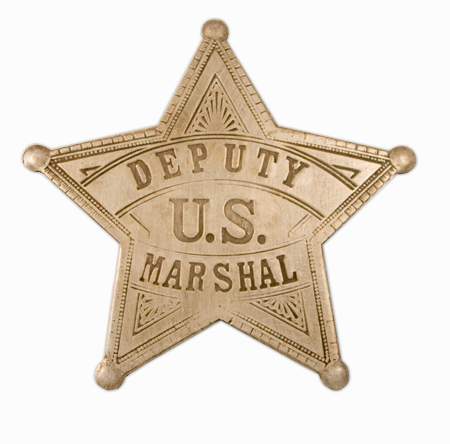 The Old West Sheriff badge is perfect for my living-history presentation. It's sturdy and well-made. And it arrived just a few days after I placed the order. Thank you! Looks real and has good weight to it. 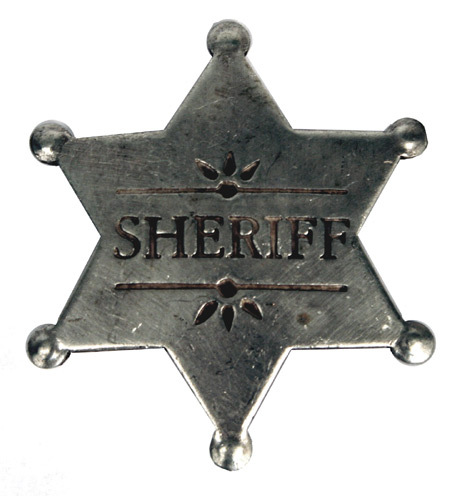 This "SHERIFF" badge will display perfectly attached to the front of my western style holster. Heavy and sturdy. Nice patina to look old. Real heft to this badge. I don't know what the original badge looks like, but I suspect this is a good facsimile. Purchased this for am old west party. The badge was great except for the pin on the back was a little big and makes a good size hole in shirt. i loved the item it's fit and design were exactly what i wanted. While the product ordered was exactly as described, and EXACTLY what we wanted, what REALLY impressed us was your quick turn around and reliable delivery. THAT is how you get repeat customers. Well done! Purchased this for use in an Old West Steampunk cosplay, as well as for some potential CAS matches at some point down the line. The badge is excellent quality, with a nice-looking patina-ed finish and a solid feel. Not flimsy in any way. True, the pin is large and may have an adverse affect on some fabrics, BUT that comes with the territory. The back of the badge did have a dry, sooty black residue on it that I simply wiped away, but be sure to clean it before putting it on anything white! Overall, excellent product and well up to my expectations. very well made (pin soldering makes me feel iffy, but im really not that concerned). quick buffing and it was a fantastic addition to my collection. It's a solid piece of metal. It feels and looks authentic. I just love it. 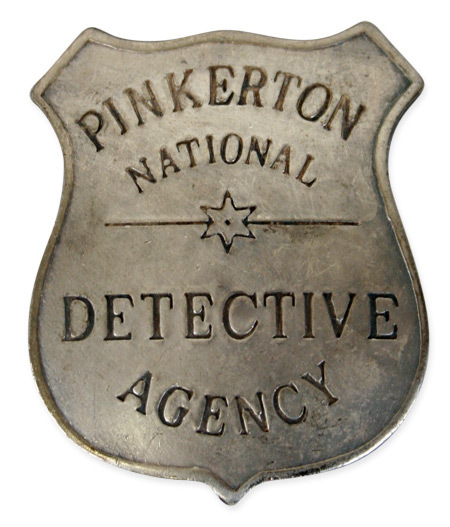 Pinkerton himself lived in a home for a short time a few blocks down from mine, here in West Dundee, IL. It will be great for Halloween. 100% what I hoped it would be. The pin is a little wide if you plan on using it with silks or Darin's be careful. As I'm from Texas I am enjoying this addition to my outfit. Looks very authentic, although I've yet to actually wear it. Love my badge. Great quality and looks like an authentic old west badge. 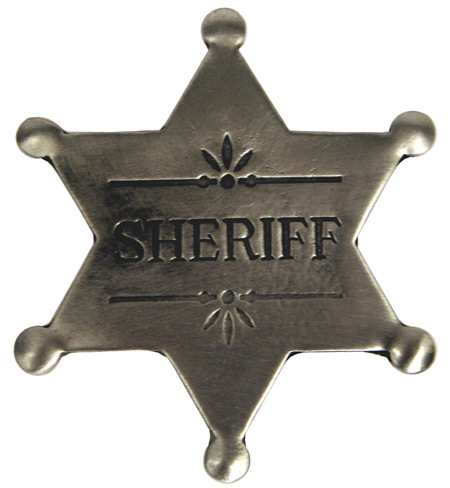 We recieved the sheriffs badge very quickly. It was everything my husband was looking for to go with his costume he wears while passing out ribbons and trophies at our local horse event. Good quality product. I am very happy with the look and feel. Product arrived in Aus after just a couple of weeks which I thought as acceptable. I found this badge to be just what I was looking for. The workmanship is great and it is a heavy and solid. This product was easy to order and arrived ahead of projected delivery time. I'm very happy with this badge and the service. I am very pleased with the Old West Marshall Badge I purchased from your company. I purchased it to go inside the display case with my authentic 1893 Colt 45 SAA Revolver. I have received very positive comments from friends who have seen it. They say it looks like it is original and really adds to the Revolver display. Thanks for such a nice product. This is so cool. I got the badge on a whim. My wife really digs it though. I bought a reproduction .45 caliber Colt 1873 Cattleman and I needed a holster. When I ordered the holster, I ordered the badge too. I am really pleased and it makes going to the gun club pretty fun. Some of the other guys at the gun club are a little jealous even though they won't admit it. This badge is of the poorest quality I have ever seen. The finish is horrible. When I tried to shine it the very thin coating of silver came off exposing the copper underneath, what the copper coating is covering is hard to say, definitely nothing any good. I've seen really cheap junk badges that looked better. I would not wear this ugly think on my fine vest. exactly what I was looking for...authentic look and feel. I could not believe how Large a Badge the U.S. Marshals Badge was! Again you guys are unbelieveable how fast after someone orders an item it is at there front door! Keep it up. I will be ordering more from You. Your service was fast as I was expecting the badge in 7-10 days! However it came like in 5 days or less. I am very pleased with the service!!!!! Also I was very pleased with the quality of the " U.S. 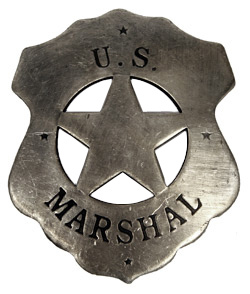 Marshal " badge! I will definitely order again!!!!!!!!!!! Thank You so much!!! Merry Christmas and Happy New Year! God Bless You All! Worked as expected and is made well. This is a really neat costume piece. Heavy, full-metal, with a thick and sturdy pin. Just be careful you don't damage any delicates with its weight of pin. 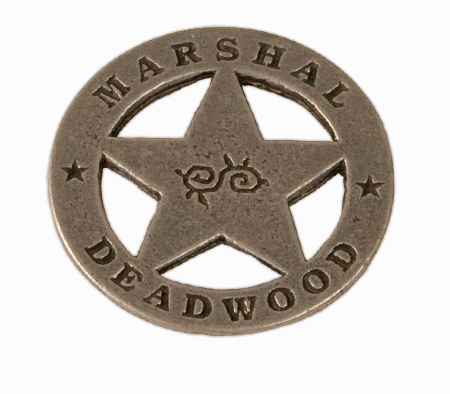 The Deadwood badge is a nice stamping reproduction of the original. it's heavy duty in construction and has a nice weight to it without being too heavy. soldered pin clasp on back is a secure attachment point for any weight garment fabric. Made in the USA is a BIG plus in my opinion. quality prop for your collection. Nice badge, though a little smaller that I had expected. Would have been better if it had been around two inches in diameter. Not a lot to say about this, it's a badge. Good quality, good price, overall great product. 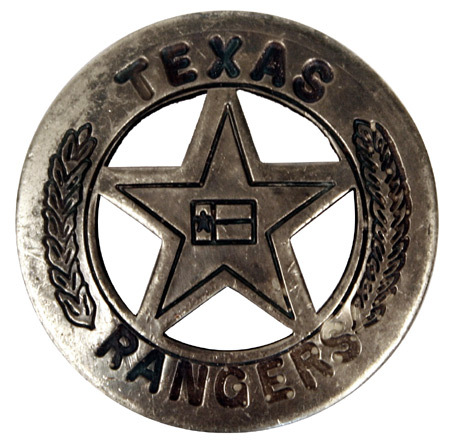 As I looked at virtually all available Texas Ranger badges on the web, it became apparent that none of them were anywhere close to being realistic. First the original was hand made from a Mexican 5 Peso coin. This one was cast metal with a pin soldered on the back. All these badges read "Texas Rangers" with an "s". The original was singular in spelling "Texas Ranger". It spoke of the man, not the organisation. In their defense, it is against the law to make an identical reproduction of a Texas Ranger badge. I wasn't looking for an identical reproduction, I needed a badge to do a show and this filled the bill. Don't expect anything more than a costume piece and particularly at this price. The safety pin on the back of the badge is junk. There is no spring action. Be careful not to stab yourself when the pin bends. QUALITY IS THERE, BUT WAS HOPING FOR A BIT LARGER SIZE. very authentic looking, as if it were used and straight out of the period. no frills, says it all. 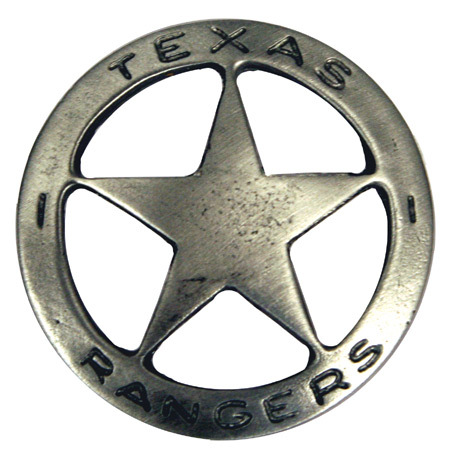 THIS IS THE BEST TEXAS RANGERS BADGE ON THE NET IT LOOKS LIKE THE ORIGINAL ONE THANK YOU FOR YOUR FAST SERVICE SEE YOU NEXT TRIP PAUL E.
Delivery was prompt! and love ze product! Perfect and looks good. Exactly what I wanted. Exactly as described. Using as part of a display, perfect for that purpose. I ordered two Old West Badge - Texas Ranger Stars which both arrived promptly and were as expected but for the pin on one badge was broken off the back due to a light misaligned weld. I'm sure this is a rarity so I'm giving a 5 star rating just the same. Star/Badges might have been a tad on the small side but the quality and size were as described. The badge is exactly as described, right down to the Mexican peso imprint on the reverse side. It was purchased as a birthday gift for my wife. She totally loves it. I'm sort of a stickler for details. 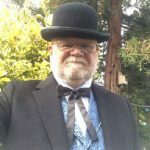 I'm a history buff, and when I do old west gunfights, I want my outfit to look authentic. 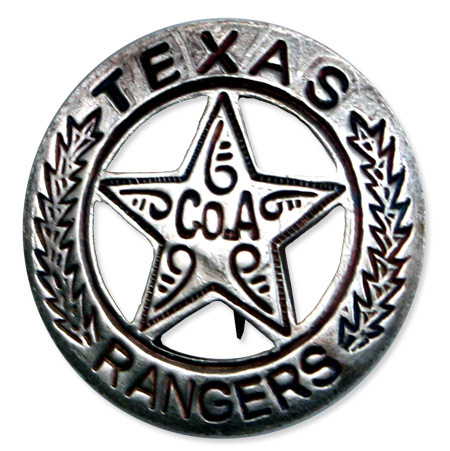 Maybe a lot of people don't know that the Ranger badges have been made from a Mexican coin, but I do. I was impressed with the detail on this badge. If it passes my inspection, it will pass most people. I like the authenticity of the badge and the fact it was made out of medal. Maybe it is me, but the badge seemed small in size and perhaps that was the way it was supposed to be worn to keep from being a target in the Wild West but I would have liked it a little larger in size. An excellent product for a cowboy action shooter! Badge seems to be very well made and looks great with any Ranger impression. I've ordered a few things before, however when I saw that there were some vests in more Big and Tall sizes, I had to jump on the chance and I was very happy with the results. The items shipped quickly and arrived within a few days, everything fit perfectly! I'm always very happy to order from this site, even though there were no issues this time any time there has been a problem they're always quick with a response. I received high-quality goods, all of which fit well thanks to accurate fitting guides. They were shipped on time and I received useful updates on the shipping schedule. I would like to see a fuller line of plus-size ladies outfits, as well as underclothes, such as petti coats and crinolines. FANASTIC!! all the way around.. from shopping to customer service.. outstanding!